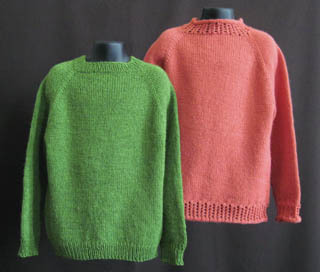 A basic sweater with simple cables, drop shoulder and your choice of crew or v-neck. Six sizes from 24" to 34". A simple 6 st cable worked in DK weight yarn makes this an easy knit. 7 sizes from 22" to 34"
3 hat sizes - 16, 18, 20"
Worked in DK weight yarn, this baby pullover is sized 18 (20, 22, 24)"
Hat in three sizes - 14 (16, 18)"
Worked in sport weight yarn, this baby cardigan is sized 18 (20, 22, 24)"
SW-009 IT'S A BOY! IT'S A GIRL! 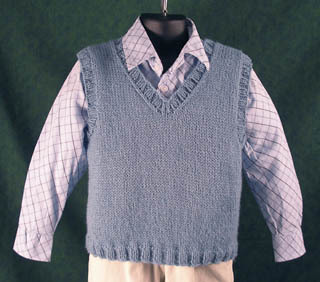 Worked in worsted weight yarn, this child's pullover sweater and vest feature a simple central cable. 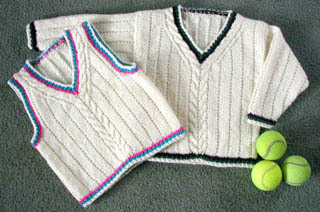 Six sizes - 24 (26, 28, 30, 32, 34)"
A sweater and cap set that is worked up in a worsted weight yarn. 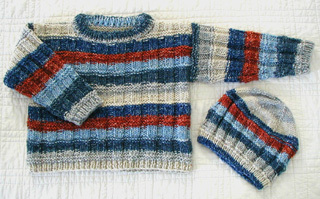 Use a self striping yarn as in our model, or use a solid and let the texture stitch show off the ribs and stripes. 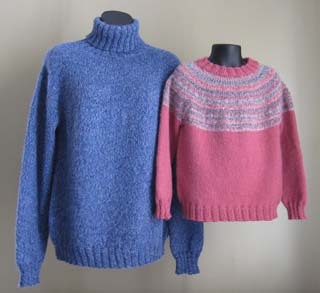 5 sweater sizes - 25 (27.5, 30, 32.5, 34.75)" 3 hat sizes 16 (18, 20)"
Worked in DK weight yarn and knit in stockinette stitch with garter trim, this pattern offers you the option of a neckband or a collar. 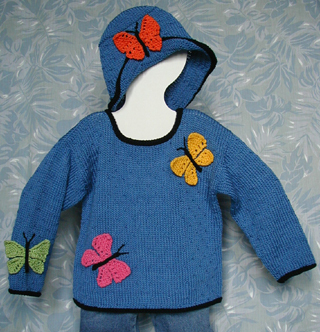 Worked in worsted weight yarn, appliqued butterflies adorn this sweater and hat. Sweater is sized: 24 (26, 28, 30, 32)". Hat is sized: 16 (18, 20)". 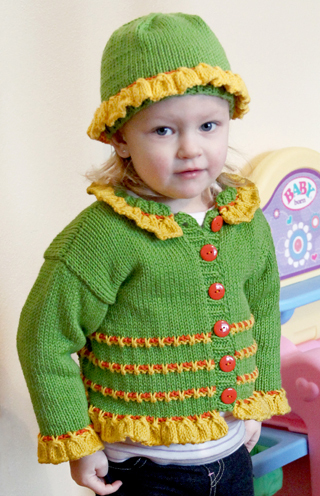 Worked in worsted weight yarn, appliqued footballs adorn this sweater and hat. 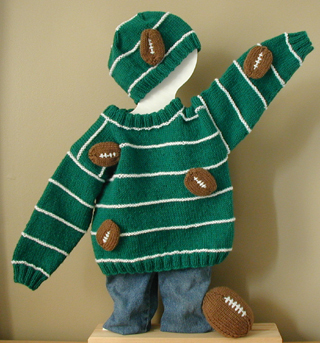 Includes pattern for toy football. Sweater is sized: 24 (26, 28, 30, 32, 34)". 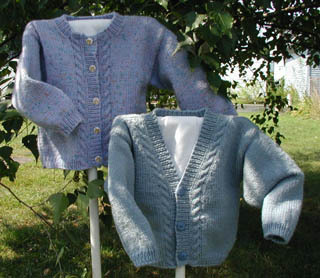 Ready to knit your first cardigan? This is the pattern to start with. 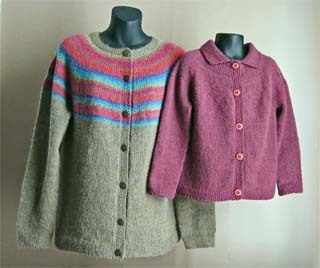 This sweater is a basic stockinette stitch cardigan with set in sleeves. Worked in a heavy worsted or Aran weight yarn and 12 sizes for children and adults: (22, 24, 26, 28, 30, 32) [34, 38, 42, 46, 50, 54]"
(24, 26, 28, 30, 32, 34) [36, 40, 44, 48, 52, 56]"
A gansey style pullover, worked in worsted weight yarn, this pattern is sized in 12 sizes. Finished chest: (22, 24, 26, 28, 30, 32) [34, 38, 42, 46, 50, 54]"
Easy to knit fair isle patterns adorn this colorful sweater and cap! Worked in worsted weight yarn and sized 24 (26, 28, 30, 32)". Hat in sizes 16 (18, 20)". 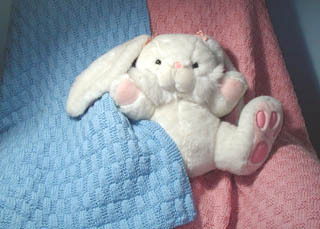 Hugs and kisses (x's and o's) wrap around your little one! 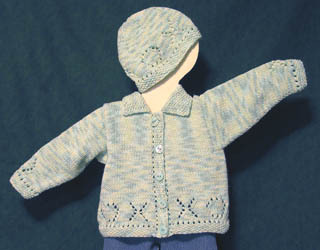 This cardigan and matching hat are worked in worsted weight yarn and the sweater is sized from newborn to 24 months - 17 (18.5, 21.5, 23, 26)". Hat is in 3 sizes. 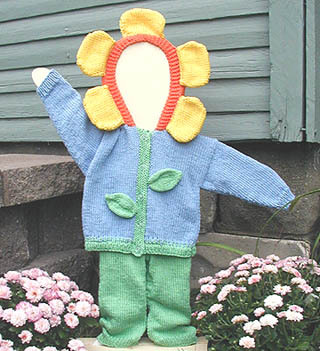 Is your little one as cute as a button? 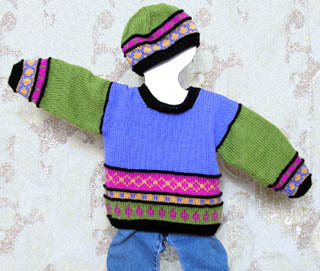 This easy knit sweater and hat are worked in sport weight yarn and sized to fit newborn to 24 months - 16 (18, 20, 22, 24)". Hat is in 3 sizes and features a button tassel. 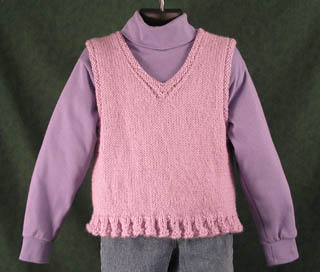 A simple stockinette stitch vest just like dad's, worked in worsted or DK weight yarn. Sized 24 (26, 28, 30, 32, 34)"
A simple stockinette stitch vest with a fun ruffled edge is worked in worsted or DK weight yarn. 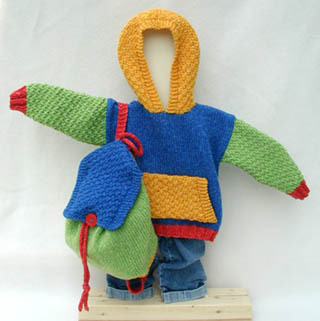 A hoodie and backpack pattern! Sweater is sized 22 (24, 26, 28, 30, 32)". Backpack is one size - kid size! with matching pants. Sized to fit NB (6, 12, 18) mos. Worked in DK weight yarn. 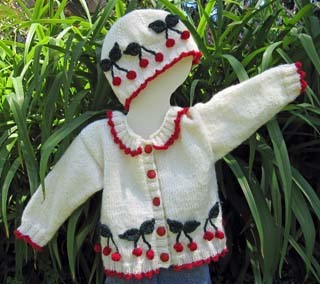 Cherry bobbles adorn this cute sweater and hat! 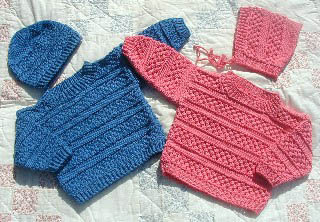 Worked in DK weight yarn and sizes 3 months through 24 months - 17.5 (20, 22.25, 24.5, 27)". 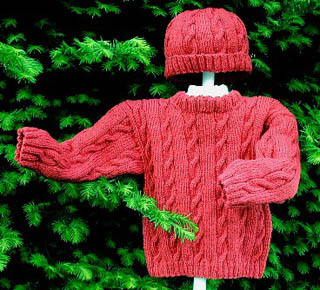 Hat is is 3 sizes: 14 (16.25, 17.5)"
A basic pullover worked from the neck down in worsted weight yarn. Your choice of turtleneck or crew neck. Ten Sizes! 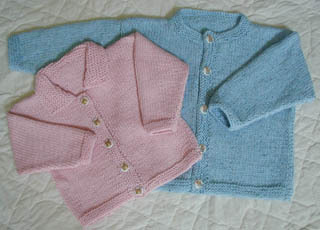 (26, 28, 30, 32, 34) [38, 42, 46, 50, 54]"
A basic cardigan worked from the neck down in worsted weight yarn. Your choice of collar or crew neck. Ten Sizes! 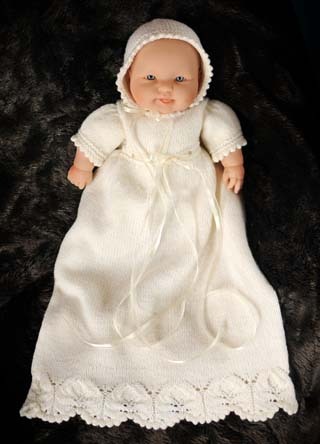 (27, 29, 31, 33, 35) [39, 43, 47, 51, 55]"
This lovely christening gown features a picot and lace edging. the gown is sized to fit NB (3, 6, 9, 12)". Bonnet is sized S (M, L). A basic crew neck raglan worked from the top down. 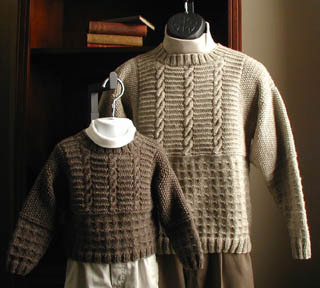 Worked in worsted weight yarn with your choice of a ribbed or lace edging. 10 sizes for children and adults - (26, 28, 30, 32, 34)[38, 42, 46, 50, 54]"
Blocks of color are featured on this playful kid's sweater & hat set! 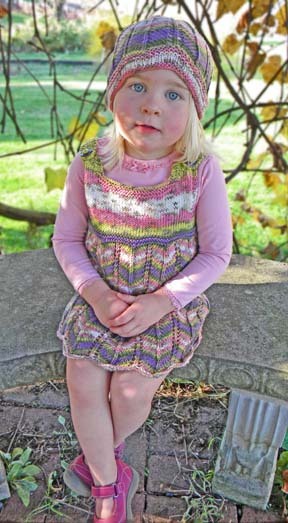 and the hat is sized at 16.5 (17.5, 19)”"
A self striping yarn and a sweet chevron pattern create the cute skirt portion of this jumper. Sized for 18-24 mos. 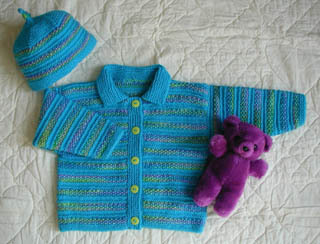 (2, 4, 6) this ensemble is worked in a DK weight yarn. The matching hat also features the chevron pattern and is sized S (M, L). Two stitch patterns, two yarn weights (worsted and DK) and two sizes (30" x 30" and 36" x 42") gives you a great choice of ways to love that bably! These basic hoodies are sure to be your little one's favorite sweater. Worked in a heavy worsted weight yarn, this pattern gives you the choice of pullover or cardigan and your choice of basic stockinette stripe or textured stripe stitch. Sized 25 (27, 28.5, 30, 32, 34)" finished chest. 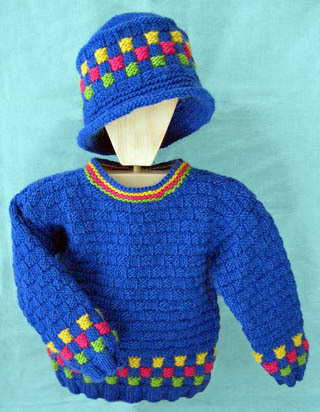 This sweater and hat set is as bright and sweet as a tropical fruit! 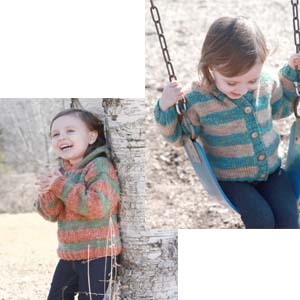 Worked in worsted weight yarn, the sweater and hat both feature a cute ruffled edge and slip stitch stripes. 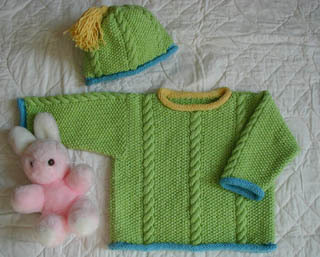 Sweater pattern includes 6 sizes - newborn through size 6. 18 (20, 22, 24, 2,6 28)" finished chest. Hat in 3 sizes - 14 (16, 18)" head circumference. 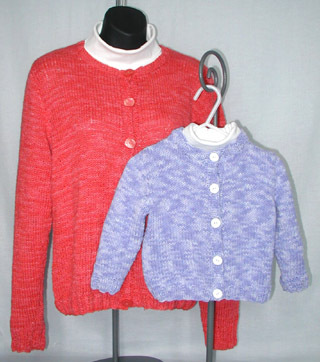 Your little one will love this sweater and hat set. Worked in a worsted weight yarn, this pattern features colored panels on the front and stripes on the back. Work in your favorite colors!